Two staff writers, convey their differing opinions about the government shut down in the form of letters to President Trump. First of all, I would like to commend you for the effort and sacrifice you have made for this country. Your commitment to what you believe in is astounding. Running a country is tiresome and I respect that you have stuck to your promise of building a wall along the southern border. Having said that, there are many practical reasons why a wall or barrier would be ineffective, a drain on hard working Americans’ pockets, and overall a terrible use of government spending. Illegal immigration is a problem, but making traumatized victims of poor, crime ridden countries out to be criminals themselves is not the best way to go about the issue. Thousands of illegal immigrants have legal records, many of which are from traffic violations and illegally crossing the border, not from violent crimes. In your address from the oval office, you cherry picked three instances where there were murders, yet crime rates of illegal immigrants are significantly lower than for United States citizens. I am not suggesting that immigrants shouldn’t take the correct path to legally enter the country. People should not be demonized by a place where they are attempting to seek asylum. Building a physical barrier to keep drugs and illegal traffic out of the country would only raise taxes for the hard working Americans. A recent article written for the New York Times describes the various ways drugs are being smuggled into the United States, and it isn’t across the border. Shipments are transported through legal points of entry by vehicles and cargo ships. Officials have found 224 tunnels dug under the Southern border since 1990, however the plan you have proposed for the wall wouldn’t even touch those tunnels. In order to have an effective way to oppose the transportation of illegal drugs across the border, the US needs to invest in more searches at checkpoints as well as more border patrol officials. Thousands of immigrants are also waiting for their requests to seek asylum to pass through the court system. Funds towards speeding up the legal process in the area of immigration would significantly help these people in need. Your negotiating efforts have been few and almost a month has gone by without any light in sight. The longer government employees go without their paycheck, the harder it will be to end their financial strain when the government is running again. MSNBC news reported that over half of government workers in America are living paycheck to paycheck and are not able to deal with unexpected expenses. Not being able to work is financially detrimental to their lifestyle. Negotiating with the opposing party has become increasingly difficult but that is part of your job as president. You are suppose to represent the American people and feeding them false information and misguided promises is not the correct way to go about your perceived crisis. If you will not end the shutdown because of your public image, at least end it to aid the government employees who are in the crossfire. Despite the amount of criticisms coming from the democrats on the partial government shutdown, it is important to keep your promise to improve national security. While some people view the shutdown as petty or irrational, they fail to see the bigger picture. The border wall isn’t just a wall- it represents a promise to Americans that you will increase national security. Too many senseless acts have been committed by illegal immigrants who’ve crossed the southern border- including murder and the transport of drugs. The length of the shutdown shows your dedication to one of America’s most important issues. At 5 billion dollars, the cost of the wall may seem absurd but it is little in comparison to the estimated 54 billion dollars spent on illegal immigrants annually says Robert Rector, a senior researcher with the Heritage Foundation. Since 2018, approval rating of the wall has increased 8%- now up to 42%. Even though democrats appear to be strongly against a barrier, not too long ago they had quite different thoughts. In the bipartisan 2006 Secure Fence Act, several democrats voted for billions of dollars in funding for barriers spanning 700 miles on the US-Mexico border- including Schumer, Hillary Clinton, and Joe Biden. More and more Americans are starting to see for themselves the importance of border security- instead of being influenced by democrats who use Americans’ feelings toward you to their advantage. President Trump, you were elected to the presidency by Americans for Americans. 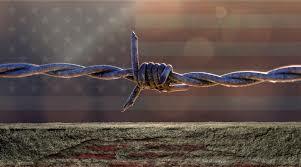 Keep your promise of national security and once the wall is built, skeptical Americans may finally see the benefits of a safer and greater nation.